I noticed recently that I’d get logged off from my computer over night. I’d leave the system running at night without logging off, and in the morning I’d have to log in again, with all the previously running programs gone. I had recently added a SATA controller in order to be able to run three SATA drives on this particular system (it only has 2 SATA ports on the motherboard), so I thought the culprit was a bad driver for the new card. Turns out that wasn’t it. My computer runs backups over night (I use MozyHome), which shouldn’t be a problem, really. 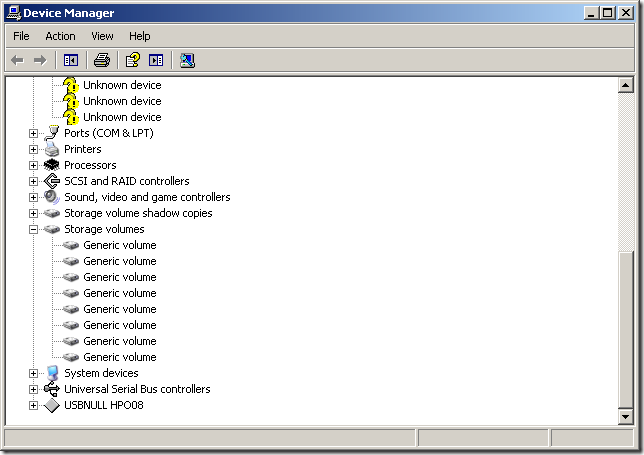 But as part of the backup, a volume shadow copy snapshot is made, and this step caused the blue screen error. In addition to adding a SATA controller, I had also bought a bigger hard drive to hold my ever expanding collection of pictures, vacation videos, etc. When I installed it, I cloned the old drive (which was a PATA drive) to carry all the information forward onto the new drive. Apparently, after you install a cloned a hard drive, some information is retained on the system about the old drive, and this affects volume shadow copies. Just for good measure I deleted all of them (although they didn’t seem to really disappear), ignoring the request to reboot after each prompt to do so. When I was done, a couple of reboots of Windows recreated the necessary information about these volumes from the (old and new) hardware. After that the volume shadow copy snapshots no longer failed and I was able to run my backups without blue screen errors. Thanks for reading! It looks like you're new here. Welcome! If you like what you see, I encourage you to subscribe to my RSS feed. If you're worried about adding another RSS feed that will add to your information overload, don't! I'm not a prolific poster. Thanks for visiting! Thank you!. Worked like a charm on my XP system having a very similar problem. 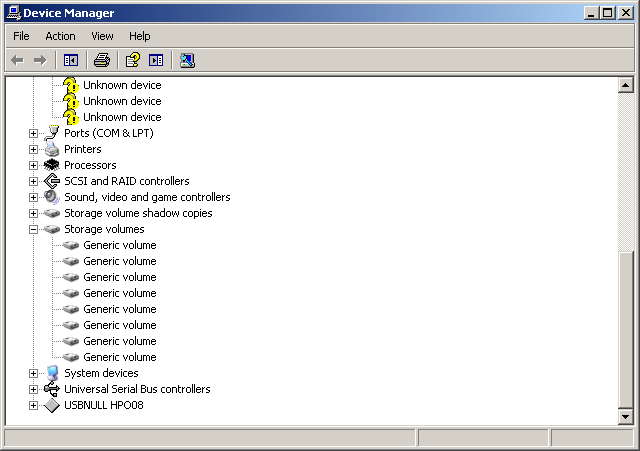 Had cloned a Thinkpad (x200) using Apricorn EZ Upgrade onto a larger HDD. System appeared to work perfectly until I ran my weekly backup (using Norton360) onto a Western Digital USB drive. Every time I ran backup; got the same BSOD with ‘Bad pool header’. I spent 5hours last night trying to resolve the problem; found lots of chatter about this problem but no working solutions. 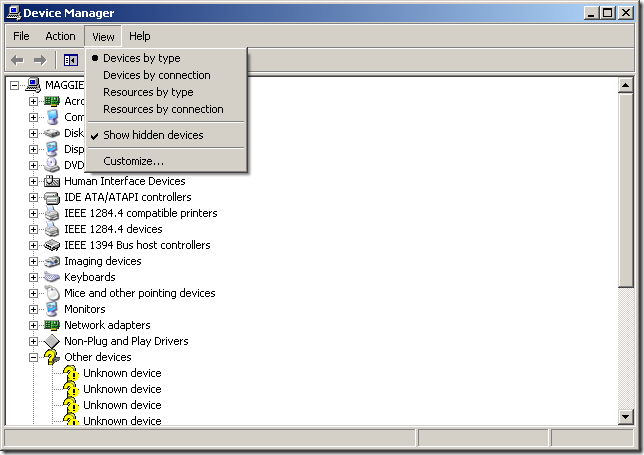 Prior to doing what you recommeded; following another recommendation, I removed all ‘ghosted devices’ showing up in my Device mgmr, but that didn’t resolve the problem (or at least not completely). Also played with Shadow Copy service, etc…to no avail. 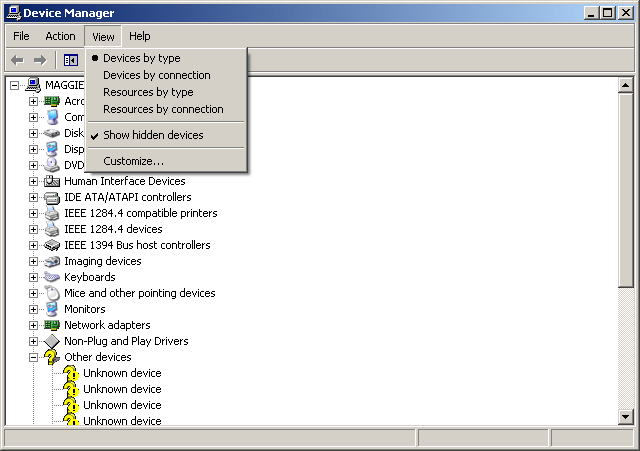 Note: under XP, to see hidden devices you need first set a environmental variable: see http://support.microsoft.com/kb/315539.